There is so much to say about how blessed we all feel from the summer ministry that just took place. God was clearly present, active, and brought forward incredible fruit in the lives of all involved. As a team we have been in a season of growing our faith. We felt God clearly calling us to take on some big projects like building cabins, water and sewage system, and running summer camp programs on the property for the first time. We were unsure of how this season of faith would end. Yet God showed us His faithfulness, perfect timing, provision, and higher ways over and over again. Thank you for journeying through this with us and for your prayers and partnership. We continued with VBS programs for 3 weeks over June and July. Our theme this year was “Living with God,” looking at what it means to know the Creator and know ourselves as children of God our Creator. Day 2 was about how living with God means remaining in Christ (Jn 15:5). We were able to see 500+ children/youth and be in 9 different villages. We were blessed this year to have two of the Hungarian Baptist seminary students join us, our teens, and our mission teams as we ran these VBS programs. An exciting development this summer was expanding church partnerships with North American churches and Hungarian Baptist churches in Romania. With the vast number of villages in Romania, there is so much need for evangelism and discipleship. 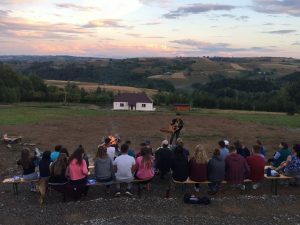 This summer we had two churches, South Canyon Baptist (South Dakota) and Thornhill Baptist (Calgary), come serve alongside us for one week and then we sent them out for their second week to work with a local Hungarian Baptist pastor. This allowed incredible multiplication of sharing the Gospel to happen. Both churches partnered with pastors who were seeking to pioneer children’s ministries in neighbouring villages, many with gypsy children. This multiplication allowed us to run multiple programs, in multiple villages at the same time, allowing the Gospel to reach more young people in Romania. South Canyon ran a VBS program as well as helped their pastor in a building project at his church. The first day of their VBS program only 2 kids showed up, but within 30 mins of the team being there the group quickly increased to 20. Then the following days it grew to 50 kids. One child that came made it apparent to all of the team members that he did not believe in God and would not. He was quite adamant about not agreeing with the message they were sharing. Yet after the week of the team spending time with this child, sharing the Gospel with him in both their message and in their love and care for Him, by God’s grace his eyes were opened! Thornhill ran 2 VBS programs each day seeing over 100 kids. At the end of the week they invited the parents to come so the kids could share about what they had learned. There was a lot of encouragement from the parents but one mom in particular stood up to thank the team for their serving. With tears in her eyes, she blessed them and prayed they would continue to come back as she saw the incredible life change in her own children. In July we ran our first ever Camp Falcon Rock youth camp!!! It was a truly incredibly week. Though we have been able to run smaller programs on the property over the past 4 years, it felt that this moment was the one that we had been waiting for for a long time. We had 21 youth come from 4 different villages. What was encouraging is that we had 3 local young volunteers serve with us this week. Two were from the Hungarian Baptist Seminary and the other was from one of the Hungarian Baptist Churches. We loved seeing young local leaders be empowered into leadership roles. These three young men were some of the camp counselors, speakers, and worship leaders for the week. For the camp program, we ran the typical sports, crafts, and team games. We also had two teaching sessions a day with small group and personal devotion time built in. We continued with the theme of “Living with God” and had a separate girls and guys teaching time one day. 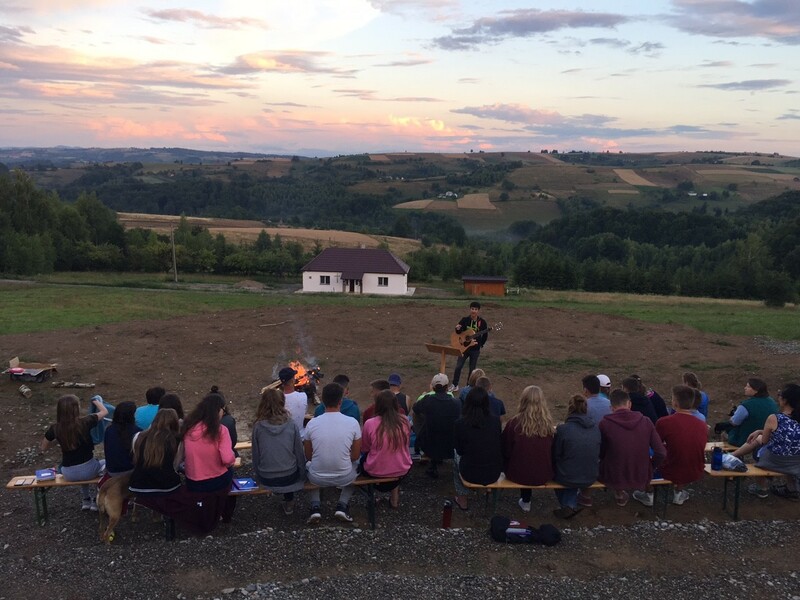 During the last campfire our hearts were filled as we watched teen after teen stand up and share their testimony of how Christ had been transforming their hearts and lives that week. One guy started off the sharing by getting everyone to close their eyes and think about what it means that God is our creator. He then said open your eyes and look around at all that God had created (which the view at the campfire is breathtaking). He then proceeded to preach a mini sermon about what it means to know this creator in our lives and His desire for us to know Him. He was one of our youngest teenagers and his impromtu sermon was one of the most powerful moments of the week. Paul and Tamas were up until midnight praying with every single guy that was at the camp. It was truly incredible and such a blessing to see God at work. During this ministry, the guys continued with construction at the camp. They were able to prepare the ground and rebar and pour two duplex cabin foundations. It is surreal to see these buildings begin to take form after all of the prayers and waiting that has gone in to this process. In June we also received our water and sewage system permits which means we will be able to begin this project in the Fall. We are really looking forward to the completion of these projects as it will allow us to expand our capacity for ministry. We clearly saw the potential for even greater ministry this summer. As we prepared for the youth camp we knew we had to run it as invite only this year due to our limited facility and we were at maximum capacity with our 21 youth. But with these projects under way we know that we will be able to open the doors of Camp Falcon Rock more fully and begin to reach more young people in Romania with the Gospel. Thank you for all of your prayers this summer and specifically for the season of faith we’ve been in. God has been so faithful and provided in big ways. As our camp director Tamas has said, we got ‘paid’ this summer as we were able to see such incredible fruit from the camp ministry. We are truly blown away by the transformation we saw in our own lives as well as those who attended the camp and feel that this is only a glimpse of what’s to come! We are all praising God for the work He did this past summer and are filled with joy with the gift that it is to serve Him.